I made my first but definitely not last visit to Pizzeria Bebu over the weekend. The small sleek pizzeria is putting out some of the better pies in Chicago. Lots of solid background info on the place at the Reader. There isn't really a name for the style - it's part of the increasingly popular contemporary American trend of thin crust pizzas that take a crispy/chewy thin crust made from sourdough that'd be good enough to eat plain and adding high quality toppings. It's a really good trend. We weren't particularly hungry so we limited ourselves to one pizza. They're all 14 inches and I'd say they're a good size for 3 people to split 2 pizzas but that'll obviously vary based on appetite. We were having trouble deciding between the pepperoni and the soppressata and happily went along with our server's offer to have them make it half and half. The pepperoni is on the regular menu and comes with parmesan, mozzarella, garlic, calabrian chile, and basil. The soppressata is on the so-called secret menu, which isn't online so I can't say what else was on it other than to note it wasn't nearly as spicy as the pepperoni half. We thoroughly enjoyed both halves. Bebu is a comfortable place to sit and eat and does serve some booze, but another option would be to grab your pizza(s) to go and walk a few steps over to Mousetrap, the new taproom from Off Color Brewing. I can't believe I haven't posted about this place because I have been going there fairly frequently, usually after seeing a movie at the nearby Arclight theater (a big reason for me wanting to see a movie there). The pizza is sensational with a wonderfully flavored, crisp and chewy crust that reflects considerable care and attention. My current favorite pizzas in the city are probably here and Spacca Napoli, though the styles are very different, with Bebu probably comparing better to Coalfire (but better in my opinion; no insult to Coalfire). 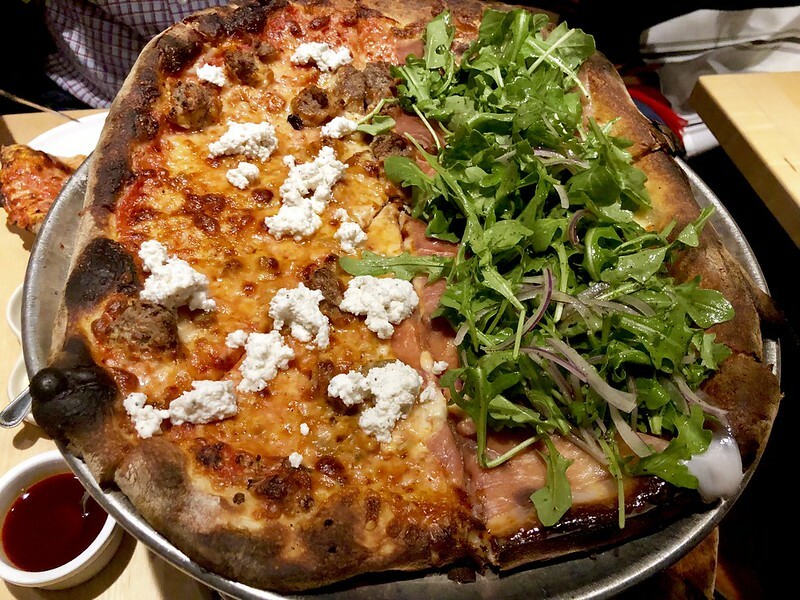 Here's my pizza from last night - have white pizza with prosciutto and arugula, and half meatball with red sauce. Yes, you can order 1/2 and 1/2 with any of their pizzas. A couple of other notes: 1) ask for their hot oil (you can see it on the bottom left of my picture), 2) order a salad - I'm usually not much of a fan of salads, but their salads are no afterthought or just placed on the menu for the diet-conscious. They're among the best salads I've had anywhere and cleverly concepted. Finally, hats off to the staff. I've always said that the staff at Bad Apple is one of the reasons I love the place. Same for Bebu - every person I've met there has been fantastic, with service better and friendlier than 99% of the restaurants in Chicago. Just note that it's a fairly small place, though I have rarely waited for a table and never more than perhaps 15 minutes. Went here over the weekend. It's been awhile since I had "fancy" pizza and I think Bebu actually delivered. Great crust, just the right amount of toppings of high quality. We went half vodka meatball and half clam (White Squall) based on Yelp reviews. The meatball was fantastic. Delicious red sauce and meatballs and blobs of high quality ricotta came together for pizza excellence. The clam was less successful having few clams, some of which came off rubbery and a flavor that was overpowered by bacon and too much salt. Still, a solid pizza. Where I will disagree was the salad. The chopped salad was highway robbery at $16, I could nearly get another pizza at that price. Other than the bacon bits being overly crispy it was tasty, but not exceptional in any way. The kale salad looked similarly uneventful after glancing at a nearby table. This is too bad because BR's comment on the salads was originally why we came! We have always thought Coalfire's salad was a travesty and a refreshing bit of greens with a greasy pizza sounds like a delightful meal. Anyways, joins Spacca Napoli as my favorite current pizza place, but it has the advantage of being much easier to dine at for me.